Learn about The Cannery Lodge. Close attention to detail took a century-old cannery and turned it into a premier lodge for every occasion. Stepping into The Cannery Lodge feels like stepping back in time without compromising on all the modern luxuries you need to have a comfortable stay, whether you are coming for a fishing adventure or a relaxing wilderness getaway. The lodge provides a personal touch that makes every stay and every event extra special. Whether you’re planning a wedding or a corporate getaway, we have the space for you. Our grounds feature ocean and river frontage, the potential for miles of skiing or hiking trails depending on the time of year, an air strip, helipad and even a boat ramp, dock and boat storage. If you live in Alaska or you’ve been to Alaska before, you already know all about the spirit of Alaska. It’s the attitude that you can sense in every person you meet and every place you visit. It’s a mental toughness and eagerness take on life in the Last Frontier. When you visit The Cannery Lodge, you’ll find that the Alaska spirit is alive and well. 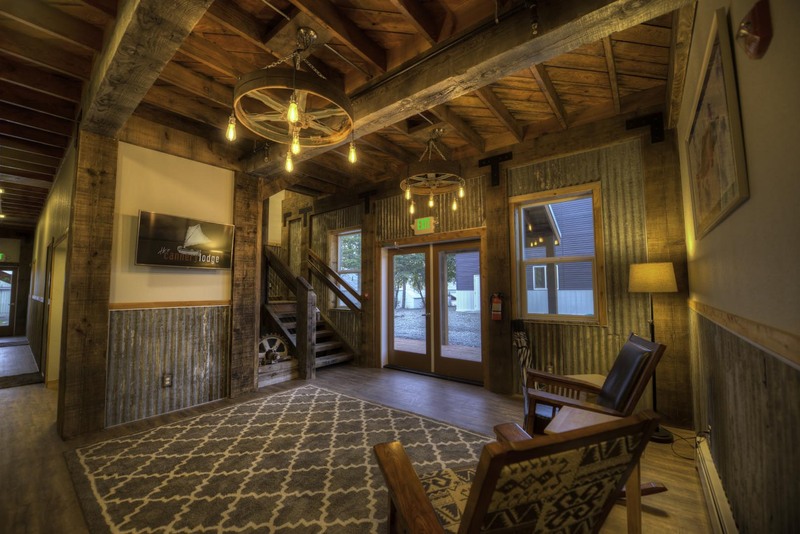 The very rooms you’ll stay in are jam-packed with Alaska history, connecting you to the unique past of Kenai, Alaska, and the people who originally settled here. Our experienced staff is full of that very spirit and they want to share it with you. Talk to any of us about the best places to fish, hike or adventure in and around the Kenai. Planning a lunch meeting? Check out the Galley! With a full commercial kitchen, chef and dining room that can seat 45 people, the only thing you’ll have to worry about is keeping people focused on your presentation instead of on the food! There are several 55-inch TVs for your presentations, so no matter where your guests are seated, they’ll be fully up to speed on the material. To talk about rental rates and menu options, just give us a call! We are happy to create a custom menu for your event. The Hydeout is one of the gorgeous spaces available for events on The Cannery Lodge grounds. The Hydeout is a great meeting space for smaller groups. The room fits 30 people comfortably at 5-foot round tables or 50 people for a standing-room-only event. The options are endless! Host a company retreat (there are two 55-inch screens available for presentations) or gather your friends and family for an intimate cocktail hour to celebrate a birthday or anniversary. Corporate meetings: they don’t have to be dull! Plan your next corporate meeting at The Cannery Lodge. The Command Center has two 75-inch TVs for all your visual needs and our experienced team can help with all additional audio and visual needs. Two conference tables can be rearranged to fit your needs and a small kitchenette will keep you going for a full day of meetings. Perhaps the most appealing features of the Command Center are the large windows with views of the river and the rest of the grounds. Your staff won’t complain about corporate meetings anymore! Call us for rental rates for this 15- by 35-foot space, perfect for 10-25 guests. Settle into this two-floor event space, ideal for 100-130 guests. Downstairs you’ll have access to the 36- by 40-foot bar area, and upstairs you can enjoy epic views in a fully furnished lounge. Several large TVs are available in this event space and a rolling 80-inch TV can be brought in for all your audio and visual needs. This space is perfect for any mix-and-mingle event. Invite friends and family to commemorate a special event, impress potential new clients or host a get-to-know-you event with your constituents. The options are endless! Call us today to talk about your event and pricing options. Say “I do” with an unforgettable view! Marry the love of your life at the Wedding Deck, complete with incredible views of the Kenai River and space for your wedding party to stand beside you. There is nothing like a destination wedding on the Kenai Peninsula. All your guests can stay right at the lodge, so you can keep the celebration going for days! Our staff is experienced in ensuring that every wedding goes exactly according to plan. Give us a call to talk about your big day. The Tidewater Stage is one of the beautiful outdoor venues on the property that takes full advantage of the Kenai River views. The amphitheater is a private space on our grounds, perfect for an intimate gathering for you and 300 of your closest friends and family. The amphitheater is set up for private concerts and events. We’ll even set up a private bar for you in the space overlooking the Kenai River. There is so much potential for this space, the sky is the limit for the types of events you can hold here. Call us to talk about your event and how we can turn this space into everything you’re envisioning and more. For anyone who wants to arrive in style, there is a private, heated and lighted, four-season helicopter pad on the grounds with an adjacent pilot house for communication with Kenai Municipal Airport Tower. The airport is a short 10-minute drive from the grounds. A commercially sized tidewater dock at The Cannery Lodge provides an on-site link to the mouth of the Kenai River, Cook Inlet and beyond. There is also boat storage available for when you’re not on the water. Flying in for the weekend? Coordinate with our staff to land right on our airstrip. 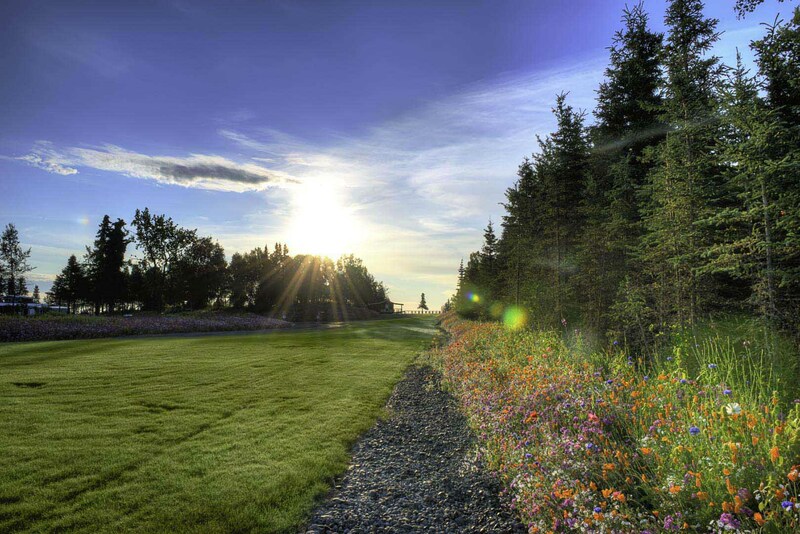 The friendly on-site staff will cater to your needs, whether it is providing shuttle services from the Kenai airport, planning a special event, guest laundry services, on-site recreation, or pointing you to the best places to explore the Kenai Peninsula. Our luxury accommodations go the extra mile to ensure your stay is as comfortable as possible.